The Traveler Series fly tying series cam vise was first introduced in 1988, and is our number one selling fly tying vise at the Platte River Fly Shop. The Traveler offers True Rotary feature Renzetti Inc is known for, as well as portability, unquestionable hook holding power and an affordable price. The T2000 Traveler Series vise as it was called back then have gone thru some major changes. From a T2000 Traveler Non Cam Jaw to a C2000 Traveler Series with Cam jaw. It was not until almost 20 years later that the most dramatic change took place, when we introduced the Traveler 2200 Series Vises. While still we offered the great features of a True Rotary Vise, the Traveler 2200 offered more comfort and longer lasting finish. We added a 7" stem to the base model, all aluminum parts were anodized, and a polyurethane jaw o-ring added longer wear to your tying need. We did not compromise in quality nor did we cut corners with this vise. Our goal was to continue to offer the beginner as well as the experience tyer a True Rotary vise that will challenge her or him as well as offer a long lasting piece of equipment. 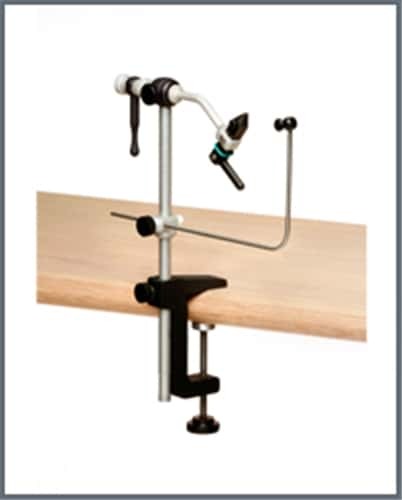 The Traveler 2200 and the Traveler 2300 Series Vises comes with anodized aluminum parts and a black powder coated pedestal base or a black power coated c-clamp, while the Traveler 2000 offers aluminum parts and an aluminum c-clamp. An adjustable bobbin cradle, case harden cam jaws, rotary tension screw, a black powder coated base with a 7" stem, or a *black powder coated c-clamp with an 8" stem. To utilize the custom features of this vise it must be ordered for the Right (R) or Left (L) hand tyer . Hooks range is giving so you can utilize the True Rotary feature of this vise. The Traveler 2200 and the Traveler 2300 Series Vises comes with anodized aluminum parts and a black powder coated pedestal base and a black power coated c-clamp, while the Traveler 2000 offers aluminum parts and an aluminum c-clamp. Regardless of how old your Traveler Vise is you can still enjoy the features and use the new components, which can be a cam jaw, crank arm, a longer stem and rotary head. See FAQ for more details on the versatility of this Vise. New for 2018: The Traveler 2304, continuing with the desire to enjoy the full True Rotary features that Renzetti vises offer, we added a material clip and a larger 6X6 base and stem support. Renzetti Inc., is a family owned business that started its operations in Romansville PA in the early 70's. I started making fly tying hand tools in a one car garage. Frustrated with the fly tying vises that were available at the time, I started working on the Presentation 3000 with the input and support of my brother Robin, that was not the first vise designed by Renzetti, however it was the first True Rotary vise made. Since its beginning, the Presentation 3000 became the vise of choice of the elite and at a retail price of $199.95 it was the most expensive vise available. By 1977 my hobby had become a part time job, and in 1978 I resigned full time job to open Renzetti Custom Machine's doors in a now 3 car garage. Eight years later, a new manufacturing facility was build and in 1988 Renzetti Inc, as it in know today, was formally introduced. Since the early 70's Renzetti's hand tying tools and fly tying vises were seldom mostly heard of and very few shops were carrying it. The Orvis Company was my first retailer and where I met my long time friend John Harder. By the late 80's the Traveler and the Presentation Series Vises were introduced and Renzetti started attending the consumer and manufacturing shows. By attending these shows I was able to be in direct contact with many tyers from around the world and listen to their feedback and suggestions. In 1996, tired of the long cold winters in Pennsylvania I moved with my family and Lois and Ed, two of our key associates to Titusville, FL., and Renzetti Inc. found a new home at 8800 Grissom Pkwy. Renzetti Inc. currently employees 10 associates, including myself, Lily and our 18 year old son. We have a well trained, wonderful, caring staff that makes everything possible. Our primary business is the manufacturing of the finest fly tying and rod building equipment in the world, but we also provide engineering and manufacturing services to many other industries around the country. 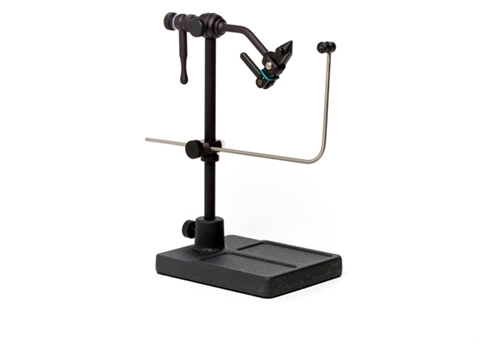 Renzetti, Inc. owns many patents and trademark and was the first fly tying vise manufacturer to offer a True Rotary Vise. Easy to use ,love the rotary aspect. Great addition to my tying equipment. Outstanding Vise! I have been tying on a beginner vise for the past 15 years, and procrastinating about upgrading my equipment for the last 10 of those years. After tying on it the 1st time, I can’t believe I waited this long. Excellent value on a premium product. Quick fast delivery right in time for Christmas. Thanks Santa. 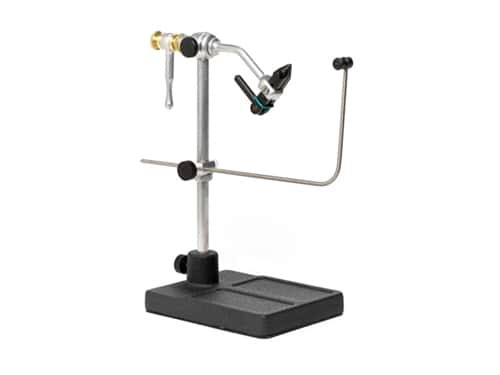 This Renzetti Traveler 2300 fly tying vise is an affordable, quality made fly tying vise that has really great features and this Renzetti Traveler 2300 Vise is really fun to use when fly tying. Great service and a great vise....thank you!